I hope you’ll pardon the brief, personal, and therefore, uninteresting post today. Last night, in addition to meeting with contacts and a small informal signing, I went to House of Shock in New Orleans. What an experience! You can see and read all about the House of Shock here: It has to be the largest, the best, and the most frightening haunted house attraction I’ve ever been to. It is so frightening that one customer actually died from fright. I kid you not. The staff is numerous and well-costumed, the lines are long, and after attending this, no haunted house could hope to compare. During my return drive today, I met with several teachers, librarians, and a principal in Brookhaven and in McComb. The good news on that as a result of these visits is that I’m going to present a program at the Mississippi School of the Arts in the future, as well as the McComb, MS Public Library. There are a few other programs in the works as a result of my queries, but I’ll let you know about those as they are confirmed. I just arrived home from my two-day trip, and I did not make plans for tonight. I’m overloaded with work anyway. Perhaps I’ll watch a movie or two, but whatever I do, I know my thoughts will be on Halloween–one of my favorite nights of the year. 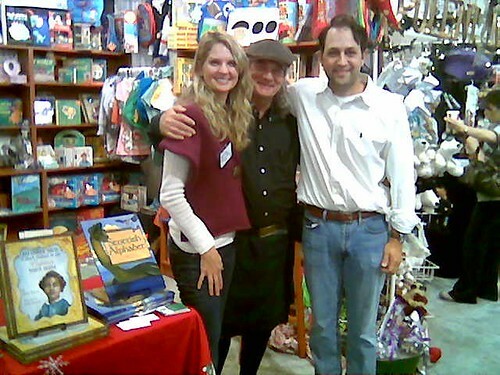 After an exhausting Friday in New Orleans, an exhausting but exhilarating weekend at NELA Celtic Fest, I am delighted to share this news: Pelican Publishing in Gretna, Louisiana, has agreed to publish two more of my children’s books. These are working titles, as I know the publisher has the right to tweak things. The first is another alphabet picture book with a working title of The Little Confederate’s ABC Book. I intend for this to be sort of Civil War primer for the children of the South. Our Southern culture and history is slipping from public and family consciousness and we need to hold on to it. Each letter of the alphabet has text in poem form that teaches the young Southern scholars about the words, history, people, and culture of the South during the Civil War. The second book has a working title of Sunday School with Professor Jackson, and it tells the story of a black Sunday Presbyterian Sunday school that the great Stonewall Jackson taught at just before the War Between the States. Several notable and influential black educators and ministers came from that Sunday school. They were also grateful for Jackson’s work, even raising money for a stained-glass window in their church that honored Stonewall. You can see that window today in the church in Roanoke, VA. The next stage involves the publisher finding a good artist for the work. I suspect the book will be available sometime next year. I’ll publish sample poems with some illustrations as the artwork comes in. Tomorrow, I’ll be speaking at the state convention of the Louisiana Reading Association. My topic is, “Why Authors Should Fall to their Knees and Worship Librarians.” I’ll try to make a post about that event tomorrow night. Yesterday afternoon, I was at Tisket-a-Tasket on Decateur Street in New Orleans. 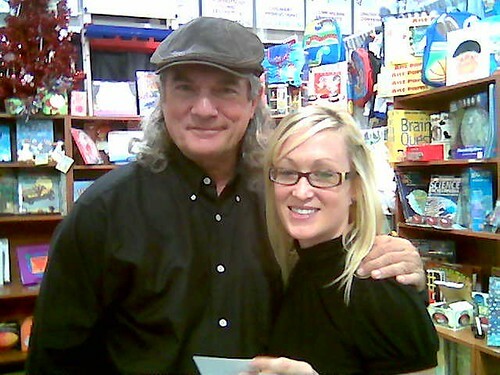 The signing went well, and Ms. Lisa, the owner, as usual was a delight to work with. I met people from all parts of the U.S. including a couple of people from Scotland (They bought the Scottish ABC book) From there, I drove to the Barnes and Noble in Metairie. There, I worked on my online classes for a couple of hours, then presented story time. What a delightful group of parents and children I met! I told stories of the Civil War and of Scotland and also played my guitar. 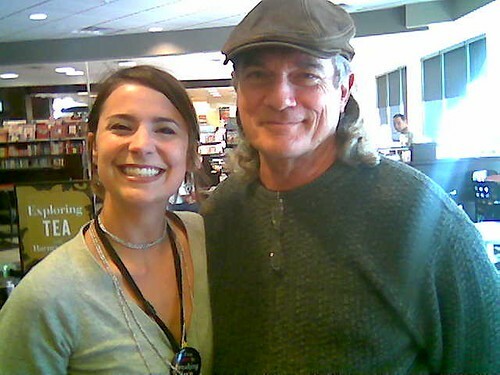 Here is a photo of me and Gina Liuzza, the Community Relations Manager of that store. She loves her work and it shows in the quality of the program she’s been able to build. She said she was quite pleased with my program. It looks like this is a store I’ll be back to. 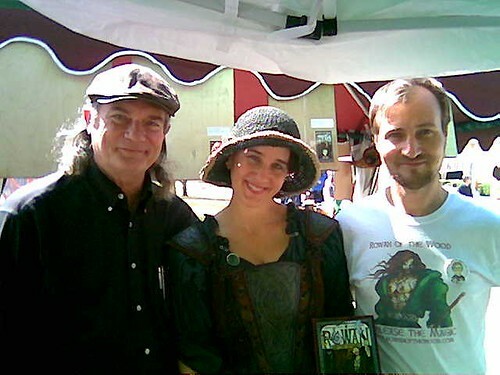 I did one signing years ago for my novel, Red River Fever. I returned home to Monroe late–about 1:00 a.m. Rose early to go to the Celtic Fest here. I worked till about 7:30 p.m. and then left. It was a great day. I ‘ll be back tomorrow and certainly will have more to report. I ran into several old friends. 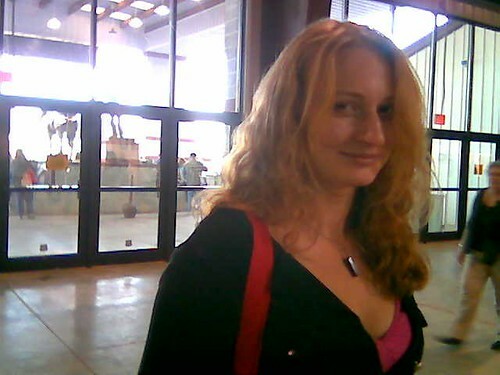 Here is a photo of my friend Amy, a very creative and sharp lady whom I haven’t seen in a long time. I decided to look at again at James Lee Burke’s novel, Two for Texas. As words are important, I decided to make a little Texas vocabulary quiz from words in the book. Take the quiz and see how you do. The answers are below. 1. Who were Houston’s “Twin sisters of Texas”? 3. What is a jenny-barner? 4. What Texas Indian tribe mentioned practiced and was known and feared for their ritual cannibalism (of enemies)? 5. What is a cutpurse? 6. The name of the only man who refused to stay and die in the Alamo. 7. In the historical setting, the town of San Antonio was known as what? 8. Which Alamo defender was said in the book to be related to Santa Anna by marriage? 10. What were maisons de chiens? 2. These men were the elite, crack troops of Santa Anna. 9. A bugle call indicating that no quarter will be given to survivors. 10. Dog houses. Wooden punishment boxes in the Louisiana prison system that prisoners were locked into. In the cramped, hot space, with only a cigar-size hole for air, men were known to go mad or suffer intense physical damage to their body. Tomorrow afternoon, I’ll be in the French Quarter for signings. Tomorrow night, I’ll be at the Barnes and Noble in Metairie at 7:00 p.m. signing books and doing a story time. I’ll then have to drive back to Monroe as I have a busy weekend with the Celtic Festival here. When I add that busy schedule to my online classes I must work with every day, it doesn’t leave much time for sleep. I’ll post as I can this weekend–hopefully with some pictures. I’ve always tended to read by author. When I find an author I like, I do try to read everything they write. I’ve long enjoyed the award winning author James Lee Burke with his Dave Robicheaux novels, so I was surprised to read a bit of his historical fiction entitled Two for Texas (Hyperion 1989). I was pleased with the read. “Where do you think you are? The regular rules don’t have nothing do to with this place” (10). “It ain’t good to look back and sometimes figure how many years you lost . . .” (42). [This is a prophetic statement] “Once this revolution is over, Texas won’t be no different than back in the Uninted States. They’ll have a rule for everything and a manacle to go with it” (65). I’ve often wondered about this scenario: Texas seceded from Mexico (by revolution). Texas joined the U.S. with the understanding it could leave. The Civil War came and Texas left. The U.S. made it stay. Hmmm. “Sometimes you can’t do everything eright, boy” ( 92). “Listen, boy. It’s no good to go back where you already been. It ain’t the same. Other people own it, and it ain’t yours no more” (113). There are so many good lines in this novel, but these perhaps will pique your interest in Burke’s book. As I am working on my Texas school programs, I found this book a good investment. Today turned cool. I drove back from Baton Rouge early this morning to attend my grandson’s baptism. I had a long day yesterday at the Junior League’s Hollydays where I played my guitar and signed books for the Lollipop Tree Children’s Store in Baton Rouge. I was there from 11:00 a.m. till 5:00 p.m. You should visit the store’s site here: Their motto is, “Where Imagination Grows.” They are located between Kenilworth Parkway and Staring Lane, near Mount Hope Plantation, at 8476 Highland Road Baton Rouge, Louisiana 70808 225-615-8069. As the signing went very well, it appears I’ll be doing more signings with them in the future. I’ve never seen such shopping madness! I met so many cool people, but I was so busy I never got to leave the booth to look around! The Junior League gave away a new Mercedes in a raffle (tickets were five dollars). Alas, my one ticket didn’t win. The store is owned and operated by Meredith Benoit and this Saturday she was helped Saturday by her Brent, also posing with us in the picture below. He is a novelist himself and we had some good discussion about writing). Here we are at the event. Here is Stephany, a young lady who is going to be a teacher. Saturday night, Michele Aucoin hosted a little soiree in Assumption Parish for some of us musicians. Steve (from Arkansas), Krushev (from Assumption Parish) and I played songs and talked until past midnight. This was my first time back to the parish in quite a while. I couldn’t help noticing the major damage the last storm had inflicted on the timber and several buildings in the area. One of Krushev’s songs is one I loved by Mickey Newbury . I did a search and found the lyrics. You can read the bio of the songwriter and descriptions of his music here: I intend to purchase his music. I searched unsuccessfully for the song on iTunes. Anyway, the song touched me. I wish now I had recorded Krushev singing the song. A smile that’s out of place. It hurts too much to face. And I would be free. After working there from 10 a.m. till 5 p.m., I have a party to attend and also play at in Assumption Parish. Will be a busy day. Teaching these online classes for Virginia College is keeping me very busy. Add to that my college classes at Delta and ULM, my band, my programs, work on my house–it hurts my head to think of all that needs to be done. I’ll try to do a post tomorrow about the Hollydays. Tomorrow, I’ll be presenting my Civil War program in the library at the Alba-Golden ISD with Lori Hooten, a wonderful and committed librarian. I’m sure I’ll post a photo or two of my trip. There is a Wild Hog Cooking contest in April, with prize money awarded! I love to eat wild game, but I’ve yet to eat decent wild pig. However, I bet these cooks can do it. RELEASE THE MAGIC & FUN! Visit our fun page for activities and trivia! Download Rowan of the Wood Wallpaper & learn about the Ogham writing Cullen finds on the tree. Find the hidden runes on the book cover. Read about the history of the Picts and Druids! Learn how to write secret notes to your friends with an ancient alphabet! And more! They have videos and more, so if you enjoy fantasy stories and cool storytellers, you should check them out. I’d long known and taught about the Irish and Scottish who filled the ranks of the Confederate Army. This weekend at the Bedford, Texas Celtic Heritage Festival, I learned about the Welsh who served the South. Jefferson Davis was of Welsh ancestry, as was Catesby ap Roger Jones surgeon and commander of the Confederate Iron Clad C.S.S. Virginia. (“ap” means son of in Welsh). This site has some other good information on their role in the Civil War, including a photo of a grave in Wales listing the name of a Welsh soldier who fought and died for the Confederacy. According to this site, there are over 10,000 pages written in America (in the Welsh language) that were composed during the Civil War. There are also countless diaries, poems, letters and other unpublished materials. I predict that this will be a gold mine of information. Efforts are being made to translate it. I met some Civil War reenactors of the 9th Texas Infantry–one of the best living history units I know of. You should visit their site. They are knowledgeable and portray a variety of units, including Zouaves. Here is a flag of the 9th Texas, Company, F. (originally from the Paris, Texas area) that the 9th Texas had on display. Note the Welsh inscription. So there were some Welsh Confederate units. As I am of Welsh ancestry (as well as Ulster-Scots) this pleased me greatly. 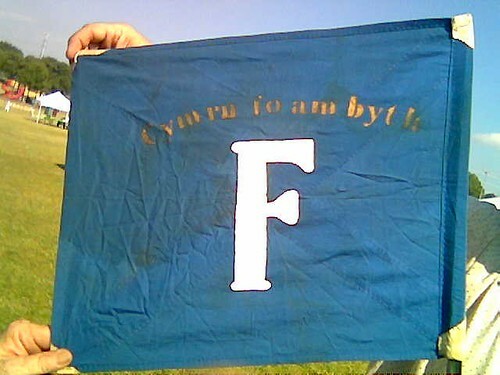 If my research is correct, the writing means “Wales Forever.” I intend to have this flag made to add to my Civil War flag collection.